Clear_Plastic_Snap_Closure_Envelopes is rated 5.0 out of 5 by 3. Rated 5 out of 5 by brayne from Completely met expectations I could not believe how hard it was to find these simple folders for my project papers. Well, these fit the bill perfectly. Rated 5 out of 5 by Julieingleman from Great Product and Service This is the fourth time I've purchased these and love them for sorting client files and being able to see what's inside. Rated 5 out of 5 by Julie from Clear Envelopes These envelopes are great for storing client files and being able to see images without opening up files. They're also handy for giving photos, etc, to clients and protect them. Great product and great service. Hello, I am trying to order 50ea of this item # 218S0clg and it is coming up Out of Stock. Can you tell me when they are expected to be back in stock? Hello. We are expecting this item back in stock by mid-February latest. Does this type envelope come in the expandable type with snap closure?? Are these snap envelopes available in 1 inch expansion?? I bought some before that had it. These are not available with an expansion. Sorry for any inconvenience this may cause. I am again trying to order your JAM Paper&reg; Booklet Plastic Envelopes, Letter-Size, 9 3/4&quot; x 13&quot;, Clear but they are again out of stock. Can you tell me when they will be available. I'd like 36. They will be back in stock end of December / early January. Sorry for any inconvenience this causes. Having the right tools is the best way to achieve success. And your basic office supplies are the best place to start. An unsystematic and chaotic workflow stalls your tasks. 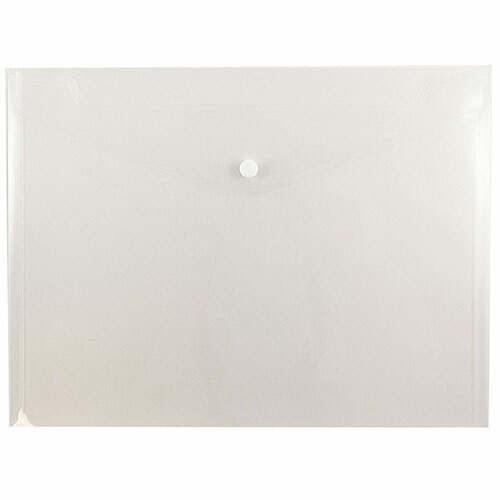 A Clear Plastic Snap Envelope instantly declutters and cleans up loose documents. So you can be well-organized and take a step closer to accomplishing your goals. These envelopes are big enough to hold oversized documents and flexible enough to hold a lot of paper. The snap closure is simple yet effectual. It’s easy to see what’s inside the envelope due to the translucency. And don’t waste time speculating on quality. These are made from substantial plastic for an enduring tear-free envelope. School. Work. Your home office. There’s nowhere that a Clear Plastic Snap Envelope doesn’t fit. Because it accommodates all sorts of papers. But wherever you use yours, it’ll help with keeping your papers together and bringing them where you need to go. Success starts with a good envelope.